Young people and digital media are a phenomenon that parents find disconcerting and that keep an army of (adult) specialists on their toes. But young people themselves know quite well how to protect their privacy – it's the adults who have some catching up to do. The question "What does privacy mean to you and how do you protect it?" immediately elicits another question: "Offline or online?" It's Friday afternoon at the Wettingen cantonal school. In room 210, Philippe Wampfler is teaching an advanced study course called Digital Society and Its Media, also known as DSM. It was introduced in the summer of 2015 because, according to the official description, "The possibilities of digitalization have fundamentally changed the way humans communicate with one another." Its declared goal is to help young people to recognize, to reflect on, and to "gear themselves to the world of the 21st century." However, it's not unusual for Wampfler, an oft-quoted DSM expert, to experience the opposite. His students often open his eyes. For example, once when he wanted to talk with the class about the statement made by a photo of two young women and a young man. "For me, it was clear that it was about the relationship of the man with one of the two women," says the teacher. His students all saw it differently. For them, it was clear that the picture is a message from the three to people who don't like them. That message: "Everything is completely different than you think, you can't tear us apart." Wampfler learned that, "There are hidden levels of meaning that I as an adult don't recognize, but that young people certainly do." Young people and digital media are a phenomenon that connects youth, disconcerts their parents, keeps an army of adult experts on their toes and can send corporate marketing departments into despair. They ask, speculate, measure, research and write studies, theses, newspaper articles, blogs, presentations and guidelines. For every theory, there is a study to support it. Often they seize upon assumptions and fears that are making the rounds, and the results become grist for the mills of people who are already concerned. In fact, many dangers do lurk in the online world. Bullying, stress, difficulties falling asleep, sleep deprivation, depression, addiction and abuse – all are threats when digital media control young people instead of young people controlling digital media. However, there is some good news: Knowledge and the balance of power are constantly shifting in favor of young users. "They are becoming more and more proficient at handling digital media," reports Gregor Waller, co-director of the Media Psychology department of the ZHAW (Zurich University of Applied Sciences), which every two years, together with Swisscom, conducts the James study, which surveys 12- to 19-year-olds on their use of media and their leisure activities. "And today they are already doing things just as well as or better than adults." With that, he confirms the assumption of three US scientists, Alexis Hiniker, Sarita Y. Schoenebeck and Julie A. Kientz of the University of Washington and the University of Michigan, who recently wanted to find out what rules families made for using technology and how the new generation got along with those rules. They heard some surprising things. For example, when asked an open-ended question, 20 percent of the children surveyed complained that their parents posted pictures of them without asking beforehand. The majority of fathers and mothers who were present didn't see any problem with that at all. "Are young people now more sensitive about data and privacy than adults?" these researchers ask. Yes, they are. Young people were asked: "How important are the following elements in protecting individuals and their personal data?" Answers of "very important" and "somewhat important"; those surveyed were between 16 and 25 years of age. Back at Wettingen cantonal school, Wampfler asks, "What are some areas of privacy offline?" He gets answers such as, "My room," "My makeup," "Me in the bathroom," "What I wear," "Who I go out with," "What I spend my pocket money on." Similarly, private spheres mean spheres of refuge and places where they can be themselves. They protect such areas with clear statements like, "Nobody can come into my room," "That's none of your business," or "Leave me alone," and with the expectation that these boundaries will be respected. And if not? The whole class laughs when someone makes a fist and nods as someone else says they'd be seriously pissed. That's understandable. After all, young people's private spheres are not usually given to them; instead they must first fight for and then defend them. And in virtual social frameworks? A study by the Pew Research Center and Harvard University reveals that young women in particular handle private information quite consciously and are by no means as naïve as adults often assume. In Wampfler's class of 17-year-olds, there are two camps. The one group protects their accounts, keeping them private, and only those who request and are approved gain access to them. The other group posts publicly, but only photos that everyone can and should see. Everyone in the room worries about their privacy. Who Is Responsible? I Am! These attitudes put Wampfler's class above the Swiss average, which isn't surprising. The fact that education is also effective in the realm of social media has been scientifically proven. The value of protecting privacy has established itself in young minds, however, completely independent of their schooling. According to the James study (a survey of youth, activities and media taken in Switzerland), 940 of the 1,000 young people between 12 and 19 surveyed are registered on at least one social network, while three-quarters of them use privacy settings to protect their profile. The 2016 Credit Suisse Youth Barometer confirms the impression that young people know quite well what they are doing. Eighty-eight percent of 16- to 25-year-olds stated that they are responsible for protecting themselves on the internet. "It's an enormous step," says Waller. "The carelessness of teenagers on Facebook in the 2000s, which is often still assumed to be the case, is gone." Incidentally, that applies to their interest in Facebook as a communication platform as well. Facebook is out. "I have an account, but I don't use it," says one student. Another reports, "I'm only on Facebook because that's the only place I hear about certain events." Young people hardly communicate with each other at all on that platform, not only here at the Wettingen cantonal school but worldwide. According to Statista, as of the end of January, 52.8 percent of Facebook users were between 25 and 34 years of age, while 13- to 17-year-olds accounted for only 5.9 percent. According to the Youth Barometer as well, Facebook is no longer in, but it has found a new reason for being – forty-seven percent use it as a news source. In that capacity, the social network has already surpassed radio (42 percent) and paid newspapers (17 percent). The fall of Facebook began the moment mothers and godparents started sending friend requests, says Allan Guggenbühl, a Zurich-based adolescent psychologist. Instead of making connections, they set off the exodus of the younger generation. Young people were asked whether or not they agreed with different statements that were presented to them. Answers of "agree completely" or "agree somewhat"; those asked were between 16 and 25 years of age. They fled to Snapchat, for one. Here, snapshots can be sent to selected and confirmed friends. They're only visible for a few seconds and then they disappear completely. This app, with such a different way of functioning than others, is difficult for adults to use, making it a playground primarily for people under 25. The influx has been enormous. By the end of 2016, 158 million users had signed on to the app, which was founded in Los Angeles in 2011. Why the hype? "If there is one fear involved in using the internet, it's that your own digital traces will not disappear," says Michael In Albon, a youth media protection officer with Swisscom. According to the Credit Suisse Youth Barometer, 52 percent of 16- to 25-year-olds in Switzerland use the communication service, which went public at the beginning of March and was immediately valued at 33 billion US dollars. But posts are not completely safe on Snapchat either. Users can take screenshots, which can be archived or circulated. That is considered a no-no, however. "Screenshots are a breach of trust," says Waller. "Anyone who abuses them won't get any more snaps." Applications like Snapchat drive a wedge, also known as generational conflict, between adolescents and their eternally youthful parents and cause tension. These are normal, desirable and even necessary "for young people to find their own identity," says psychologist Allan Guggenbühl. And digital expert Philippe Wampfler sees it much the same way. "Young people do not use the internet differently because they grew up as digital natives but because, given their age, they have to establish their own network of relationships." The goal is to achieve more distance from adults, and the measuring stick is the smartphone, that multi-functional communications center. According to the James study, 99 percent of Swiss young people have one. These devices, like the apps, are not technology primarily targeted for these teenagers but rather a part of their popular culture, their present world. And it is a world of images. Pictures have become a central means of communication and young people are playing a pioneering role in this development. Their demands for material are high, and they put a lot of thought and energy into them. "Being in a swimming pool in a bikini is totally different than posting a picture of yourself in a bikini in the pool on Instagram," says one of Wampfler's female students. Her peers see it the same way. The group also agrees on how to handle pictures that include friends: Ask first, then post. These young people are also well aware of the fact that not everything on the internet is true. They seem quite capable of evaluating online comments. 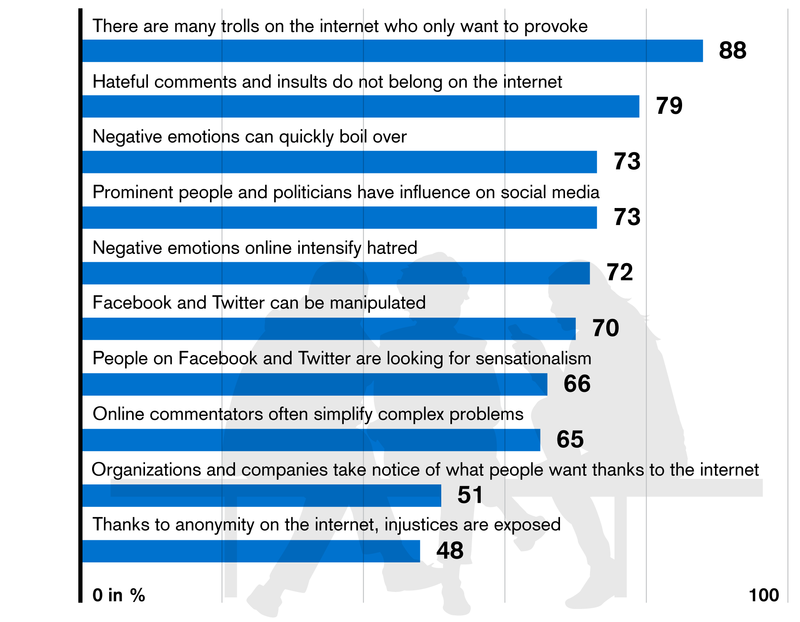 Eighty-eight percent know that there are trolls on the internet, according to the Credit Suisse Youth Barometer. So everything's great, everything's under control? "It's unbelievable how much time you can spend on Instagram and the like," one student reports. "It's just gotten to be too much for me, I'm still on it but only when I want to be." Another explained that he had deleted his old account, which had hundreds of followers waiting for news from him, and opened a new one, "with barely 50 followers, totally stress-free and relaxed." Instagram, owned by Facebook since 2012, is a large stage for self-representation, with clear production rules. It's all about beauty. Photos that are uploaded there must be perfect, "likes" are the currency, caution is the insurance policy and the private sphere is the bank vault. Media psychologist Waller knows about these unwritten laws. For instance, on Instagram, never post anything when you're under the influence or while you're out – wait until the morning after, if at all. Real world, virtual world – for most young people there is only one. Online is as real as offline. They are experienced users and astute when it comes to this domain, which they are prepared to share or to stake out, often to the chagrin of their excluded parents. One student explained that, as a rule, she posts pictures on Snapchat for just two seconds, "too short for a screenshot." And too quick for a parental "Let's take a look." The recess bell rings. One last story: It's about a 15-year-old boy whose parents made it a condition that he download an app with GPS tracking on his mobile phone if he wanted to go out. He accepted the terms, and the GPS app was installed. Since then, he always leaves his smartphone with a friend before he takes off. Iris Kuhn-Spogat is a freelance journalist and the mother of two teenagers, with whom she is not "friends" on any social media network.